My birthday is five days before Christmas, and his is five days after. Truly, I have the better deal. Once Christmas has been celebrated, the world is weary, and even the things on the must-do list fall by the wayside. The year Camden turned two, I was especially tired, and I could barely make his birthday happen. I bought a cake, and then I felt guilty that I bought a cake, so I frosted over the existing decorations so it would look homemade. I wasn't trying to impress anyone, it was only the four of us at the table, so I did it for... me. I remember being in tears over it, and Eric thinking I had lost my mind. I know it sounds ridiculous. Even to me, now. But then? Then I didn't know that the cake was just a cake... and the centerpiece of the celebration was the people and the love around the table. I wasn't comfortable enough in my motherhood to take what I considered the easy route... and I certainly didn't realize that some people always buy the cake. I didn't yet know that the mess of motherhood can be beautiful. 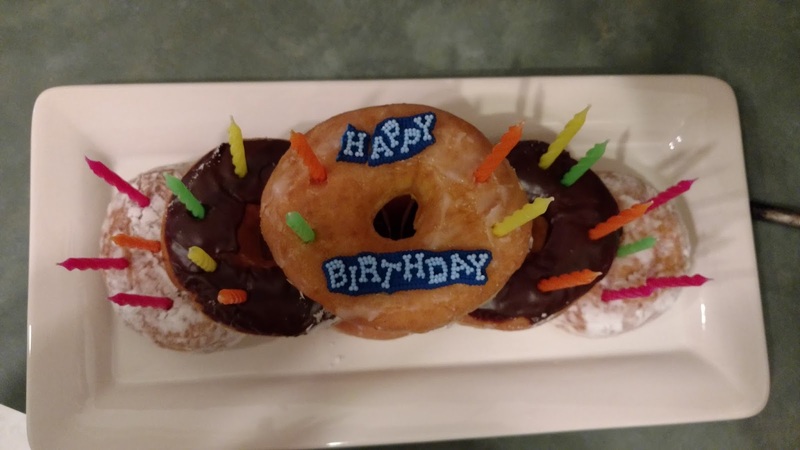 I piled up some donuts on a plate, stuck a broken sugar "happy birthday" on the top, and called it his birthday cake. He thought it was the best idea ever, and he was thrilled. 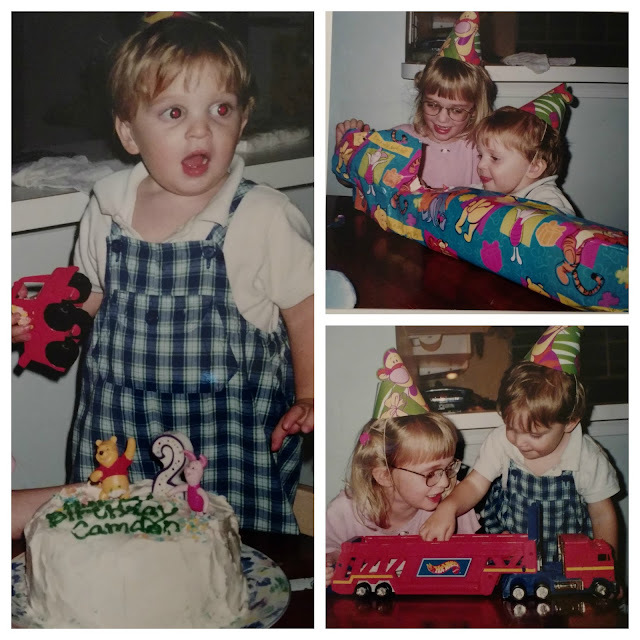 I have come a long way in these seventeen years, learning to find the joy in the mess, and accepting grace when I don't live up what I thought I would be. I have learned I don't have to try to be perfect... that their idea of the perfect Mom is the one they have. You on my heart this morning. Went to text and my phone had died (I had just charged it!). Then this. Yay! It's so good to hear your "voice" here. Look at your blonde babies!! So sweet. The pressure we put on ourselves when we were young. Jacob had that same truck that holds Hot Wheels only his was blue. Ethan inherited it and it's still here. Nora and I LOVED his "cake" this year!! Why do we put such guilt on ourselves? I do it too...I always have. I always make a "First Day of School Cake." Typically it's something crazy and festive. This year, I just didn't have it in me. I still made a homemade cake (I even made it tie-dyed inside) but I beat myself up over the fact that it was just frosted simply with sprinkles. REALLY??! When I think about it now, it just seems like such a silly thing to get upset over. But, I was. I felt like I had let the girls down. And, deep down I know that my girls are not even going to remember the decorations...just the fun and meaning behind our little tradition. This is beautiful. Why does it take us so long to learn the valuable lessons in life? All the stress and worry we put on ourselves.....it's not like anyone else does it to us. Goodness. That donut cake looks just divine to me.